Despite attending the same London music school as Fela Kuti in the early 1960s, this is only the second international release from Ghanaian highlife guitarist Ebo Taylor. Now in his mid-70s, Taylor has had to wait to spread his name further afield. And so there is a sense of making up for lost time in this follow-up to 2010's Love And Death. That's not to say Taylor hasn't been prolific. Following on from the influence of fellow Ghanaian musical pioneer ET Mensah, Taylor played in and was frontman for several of the country's best known big bands, including the Stargazers and Broadway Dance Band during the 1950s and 60s highlife explosion. And last year's anthology compilation, Life Stories, which covered his 70s output, showed Taylor had a vast back catalogue for the compilers of the record to cherry pick from. Showcasing eclectic tastes by distilling a fusion of Afrobeat, jazz, soul and funk with traditional Ghanaian sounds in his music, Taylor was also an in demand in-house arranger and producer for labels, including Essiebons, and artists, like CK Mann and Pat Thomas. And now, thanks to recent appearances on compilations by Soundway Records and Analog Africa, Taylor has been rediscovered with an opportunity to reach a wider audience. 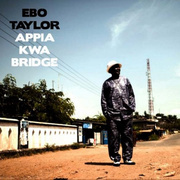 On Appia Kwa Bridge Taylor is backed by the Berlin-based Afrobeat Academy, over eight tracks of high energy soul, jazz and funk. The album also features appearances from Afrobeat heavyweights including Fela Kuti/Africa 70 musicians, drummer Tony Allen, guitarist Oghene Kologbo and congo player Addo Nettey, aka Pax Nicholas. Throughout the record Taylor keeps alive ancient storytelling traditions through song, each telling a personal story, or of the plight of the Fante people. On opener 'Ayesama' he repeats, "What's your mother's name?" like a rallying tribal cry, in what is a traditional Fante war song. On the jazz-flavoured second track he preaches against 'Abonsam' (an evil spirit). The track's bluesy feel is something that is explored elsewhere, in a more stripped back form. Taylor revisits songs not just from his past, but also musicians around long before he ever picked up a guitar and in doing so makes sure 'Yaa Amponsah' is set to reach new ears. This was originally recorded in the 1920s by Jacob Sam's Sam's Trio, and was covered in the 1970s by Apagya Show Band, another of Ebo's groups. Here it is just Ebo and his guitar, and it is a refreshing treat to hear this strand of West African blues in such an undiluted form. It is matched by the album closer, this time a Taylor original, 'Barrima,' which follows a loose structure, improvised around the heartfelt message, and is dedicated to his recently deceased wife. These songs showcase the raw mastery of the guitar in the hands of someone who has been playing their whole life. Another song from Taylor 's back catalogue to get a dusting down is 'Krumen Dey', which he describes as a 'Deep Purple' track, as the guitar and bass play the same riff. He played it in the 70s with Apagya Show Band, under a different title, 'Serwa Brakatu'. The lyrics were supposedly written by a mad man, telling the story of Liberian and Ivory Coast workers who arrived in Ghana, taking on menial jobs. Ebo's son Henry takes on lead vocals on the track, singing in Pidgin English: “Come on little children, we got to play the game,” of counting Krumen people. Each song has a very different message, although it is the highlife feeling that stays with the listener. In the title track Taylor sings of a place where lovers meet to a backdrop of slinky Farfisa organ lines and uplifting brass. And while up to now his name may not be as well known as his old school pal Fela, with these recordings Ebo Taylor proves his survivor credentials. In 'Nsu Na Kwan' (water and stone), Taylor sings “The river is older than the footpath, which is man-made. The river was made by God, it is the oldest,” urging the listener to respect their natural surroundings. Like the river, the singer has seen it all.